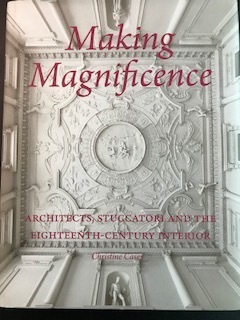 This book tells the remarkable story of the craftsmen of Ticino, in Italian-speaking Switzerland, who took their prodigious skills as specialist decorative plasterworkers throughout Northern Europe in the 18th century, adorning classical architecture with their rich and fluent décor. Their names are not widely known – Giuseppe Artari (c.1690-1771), Giovanni Battista Bagutti (1681-1753) and Francesco Vassalli (1701-1771) are a few – but their work transformed the interiors of magnificent buildings in Italy, Austria, Germany, the Netherlands, Britain and Ireland. Among the interiors highlighted in this deeply researched, beautifully illustrated volume are ghe Palazzo Reale in Turin, the Upper Belvedere in Vienna, St. Martin in the Fields in London, the Radcliffe Camera in Oxford, Houghton Hall in Norfolk, and Carton House in Ireland.